Give your cheerleader a homemade gift or help her make some fun and easy crafts to give to the whole squad. The perfect cheerleading craft combines school spirit with cheerleading pride to create an item to display, trade or wear. Create some easy cheerleading crafts in a single afternoon or work on them over a series of days leading up to cheer camp or the first game. Get your cheerleaders together at practice after school one afternoon and drape the school in spirit by decorating the cheerleaders' and players' lockers before a big game. At a craft store, purchase foam cut-outs of megaphones and footballs or basketballs. Using a permanent marker, personalize the foam cut-outs with the athletes' names and numbers. 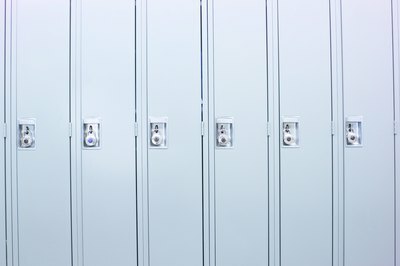 Using non-permanent adhesive, cover the locker door with wrapping paper in the school's colors. Add the foam cutout. Using scrapbook paper trimmed with pinking sheers and layered, write a personalized good luck message to the athlete from the cheerleaders and post them on top of the wrapped locker doors. Decorate the cheerleaders' lockers with messages of luck to the school and the players. Create spirit bows to avoid tying a ribbon bow around the ponytail at every game. Using one yard of ribbon per bow, tie a bow and glue it to a ponytail holder using a hot glue gun or permanent fabric glue. Use a scrap of matching ribbon to tie the bow onto the ponytail holder and cover the knot with a dot of glue for extra security. Trim the bow's tail ends at a 45-degree angle. Apply clear fingernail polish or fabric fray preventer to the ends to prevent the ribbon from unraveling. Purchase some plain t-shirts for the squad and embellish them to wear at cheer camp or on spirit days. Use fabric paint and stencils or applique letters to add names or nicknames to the shirts. Gather and tie the sleeves in ribbons in school colors. Use fabric glue to apply rhinestones to the neckline or hem. Pre-wash the shirts and all fabric trims before embellishing to prevent shrinking the finished product. Tie-dye a t-shirt or cheer shorts for practice or camp. Choose two or three colors that will look good separately and blend well. Prepare the dye according to manufacturer's instructions. Twist the entire garment and secure with rubber bands. Soak it in the lightest dye for the recommended time first, then rinse and re-twist. Repeat the process with the darker dyes. Wash and dry the garment before wearing.